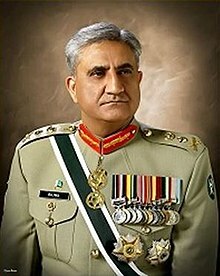 The Chief of Army Staff (Urdu: سربراہ پاک فوج‎) (reporting name: COAS), is a military appointment and statutory office held by the four-star rank army general in the Pakistan Army, who is appointed by the Prime Minister of Pakistan and final confirmation by the President of Pakistan. On basis of seniority, subjected to the decision of the Prime Minister of Pakistan. The designation of the Chief of the Army Staff was created from the previous title Commander-in-Chief of the Pakistan Army in 1972. Since 1972, there has been 10 four-star rank army generals to be appointed as chief of army staff by statue. The Prime Minister approved the nomination and appointment of the Chief of Army Staff, with President confirming the Prime Minister's appointed choosing and nomination. Due to the powers granted by the Constitution of Pakistan to assist the civilian government led by popularly-elected Prime Minister to control and command the law and order, the chief of army staff has been instrumental in instigating and enforcing the coups d'état against the civilian government and the Prime Minister. :40 In 1977, General Zia-ul-Haq was the first army chief who carefully planned a coup against Prime Minister Zulfikar Ali Bhutto when the right wing opposition instigated popular demonstration after the general elections held in 1977. After the Pakistan Army's performance in Kargil sector, Prime Minister Sharif terminated the commission of General Musharraf, as an army chief and chairman joint chiefs, but Musharraf refused to follow the orders by instigating and leading the military coup by turning over the government under his control on 12 October 1999. The Vice Chief of Army Staff (VCOAS), is the post that is principle deputy and second-in-command (S-in-C) of the Pakistan Army, reporting under the Chief of Army Staff. The position was created in the existence of army chief is simultaneously the President of Pakistan, having taking over by imposing the martial law against the elected civilian government. :contents The post is now nonexistence and no longer in commission with the army— the Chief of General Staff now serves as the second-in-command in the army leadership. The vice army chiefs are considered to be the principle commander of the army but not altogether, as the vice army chief has to report to the army chief, specifically in taking decisions regarding the promotions. :contents The post of the vice army chief is a senior position and its officer is a four-star rank army general. All persons mentioned below have served as the Vice Chief of the Army Staff with distinction of General Abdul Hamid Khan who acted as the 'Chief of Staff' (COS) of the army under General Yahya Khan who was the President of Pakistan and also the holder of the title 'C-in-C of the Army'. ^ a b MoD, Ministry of Defence. "Organogram of MoD" (PDF). mod.gov.pk/. Ministry of Defence Press. Retrieved 22 July 2017. ^ "Lt Gen Raheel appointed as new COAS, Lt Gen Rashad as CJCSC". The News. 27 November 2013. Archived from the original on 1 December 2013. Retrieved 16 December 2013. ^ a b Shabbir, Usman (2003). "Command and Structure control of the Pakistan Army". pakdef.org. PakDef Military Consortium. Retrieved 24 July 2017. ^ a b Inc, IBP (2009). Pakistan Intelligence, Security Activities and Operations Handbook - Strategic Information and Developments. Lulu.com. p. 230. ISBN 9781438737225. Retrieved 24 July 2017. ^ "New Pakistan army chief takes command". news.yahoo.com. Retrieved 16 December 2013. ^ "Will retire on November 29, Kayani confirms". The Express Tribune. 6 October 2013. Retrieved 16 December 2013. ^ "General Bajwa takes charge as Pakistan's 16th army chief". DAWN. 29 Nov 2016. Retrieved 29 Nov 2016. ^ "Gen Bajwa assumes command as Pakistan's 16th army chief". The Express Tribune. 29 Nov 2016. Retrieved 29 Nov 2016. ^ "Pakistan: Army and Paramilitary Forces". www.factba.se. Retrieved 16 December 2013. ^ "The Army Chief's". www.pakistanarmy.gov.pk. Retrieved 16 December 2013. ^ Zahra-Malik, Drazen Jorgic and Mehreen (26 November 2016). "Pakistan PM Sharif names General Bajwa as new army chief". Reuters UK. Retrieved 26 November 2016. ^ Cheema, Pervaiz Iqbal (2002). "Defence Administration". The Armed Forces of Pakistan (google books) (1st ed.). New York, U.S.: NYU Press. p. 225. ISBN 9780814716335. Retrieved 25 July 2017. ^ Tudor, Maya (2013). The Promise of Power: The Origins of Democracy in India and Autocracy in Pakistan. Cambridge University Press. ISBN 9781107032965. ^ Bhutto, Zulfikar Ali. "If I was assassinated" (PDF). ^ Burki, Shahid Javed (2015-03-19). Historical Dictionary of Pakistan. Rowman & Littlefield. ISBN 9781442241480. ^ Crossette, Barbara (1999-10-13). "COUP IN PAKISTAN -- MAN IN THE NEWS; A Soldier's Soldier, Not a Political General -- Pervez Musharraf". The New York Times. ISSN 0362-4331. Retrieved 2017-11-21. ^ a b Chitkara, M. G. (2003). Combating Terrorism. APH Publishing. ISBN 9788176484152. Retrieved 24 November 2017. ^ Hashwani, Sadruddin (2014). The Truth Always Prevails: A Memoir. Penguin UK. ISBN 9789351188322. ^ InpaperMagazine, From (8 October 2011). "Flashback: The Martial Law of 1958". DAWN.COM. Retrieved 24 November 2017. ^ Gupta, J. B. Das (2002). Islamic Fundamentalism And India. Maulana Abul Kalam Azad Institute of Asian Studies, Kolkata. ISBN 9788178710136. ^ Haqqani, Husain (2010). Pakistan: Between Mosque and Military. Carnegie Endowment. ISBN 9780870032851. Retrieved 24 November 2017. ^ a b c Cloughley, Brian (2016). A History of the Pakistan Army: Wars and Insurrections. New York [u.s[: Skyhorse Publishing, Inc. ISBN 9781631440397. Retrieved 21 July 2017. ^ "General's first gambit". The Indian Express. 16 December 2016. Retrieved 14 August 2017.